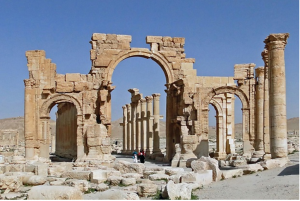 The reconstruction of the arch that will be erected in London is the work of the Institute for Digital Archaeology, a joint venture between Harvard University, the University of Oxford, and the Museum of the Future, Dubai. Two of its predecessors were celebrated in an exhibition at the Arthur M. Sackler Gallery in Washington DC in the second half of 2015. 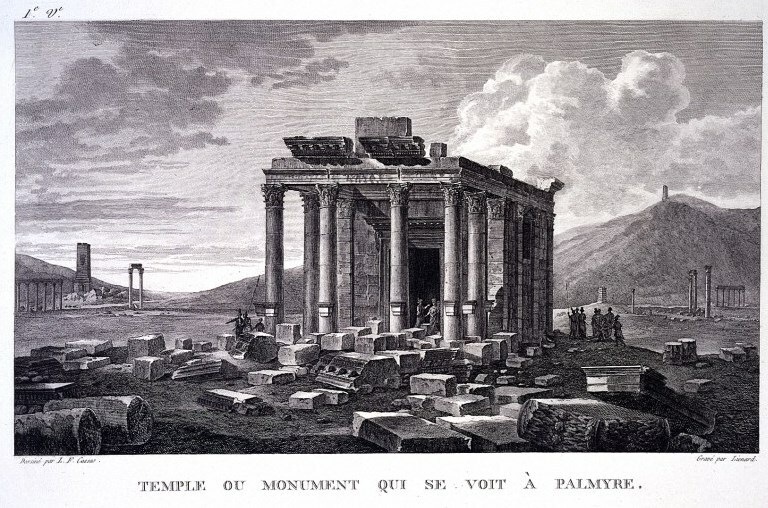 The exhibition united two earlier records of Palmyra: the famous book of engravings created by the Irish scholar Robert Wood under the title the Ruins of Palmyra, Otherwise Tedmor in the Desart (1753); and albumen prints (photographs) of Palmyra by Félix Bonfils (1831-1885). The engravings and photographs are reproduced in a video produced by the museum, in which the qualities of the respective media and the interests of the two authors may be compared and contrasted. Wood’s engravings, based on measured drawings, are unrivalled in quality as records of the buildings as they were when the crispness of the stone carving was less weathered than it later became. Looking at the photographs by Bonfils, one must marvel at the time he presumably spent painting out the sky on his negatives, as not a single cloud appears. 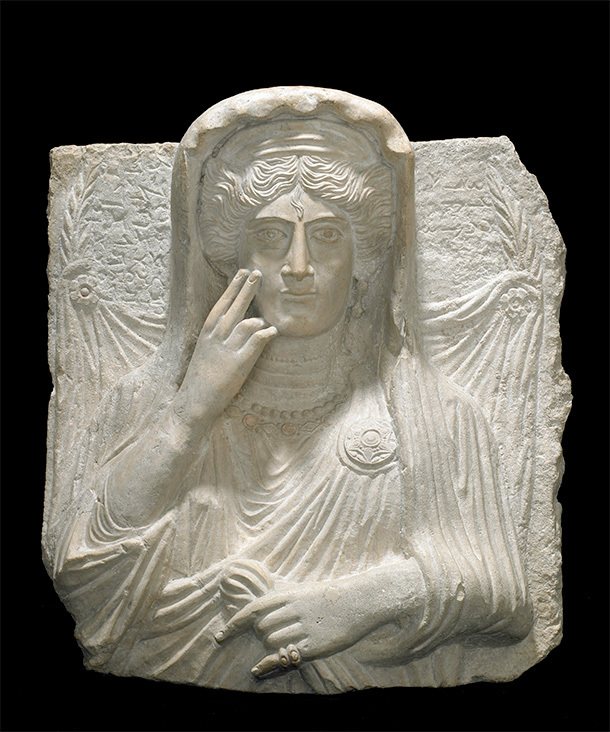 Keeping them company was a Palmyrene limestone bas-relief portrait of a smartly dressed woman (above). She looked the Washington visitors firmly in the eye while resting her chin on her right hand to support her head during the long afterlife which she (correctly) expected. Between Wood (circa 1750) and Bonfils (circa 1870) there was another visitor who deserves commemoration: Louis François Cassas (1756-1827). 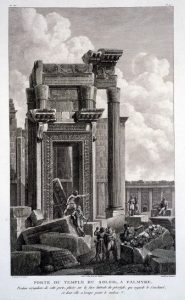 He visited Syria in the 1780s, and published his drawings in a series of superb engravings which started to appear in year VII of the French Republic (1799). However, “le mieux est l’ennemi du bien”: such was the quality and size of Cassas’s engravings (some of the sheets are a metre wide) that it is not surprising that they were never completed. 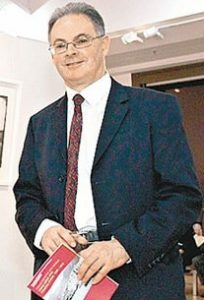 A collection of the engravings is available in the Wellcome Library, and a selection of them was on display in the Wellcome Building in London in the 1990s, in fine neoclassical frames. 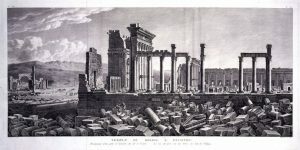 Among his largest prints is a panorama of the ruins showing the grand colonnade, with the great temple of Bel. 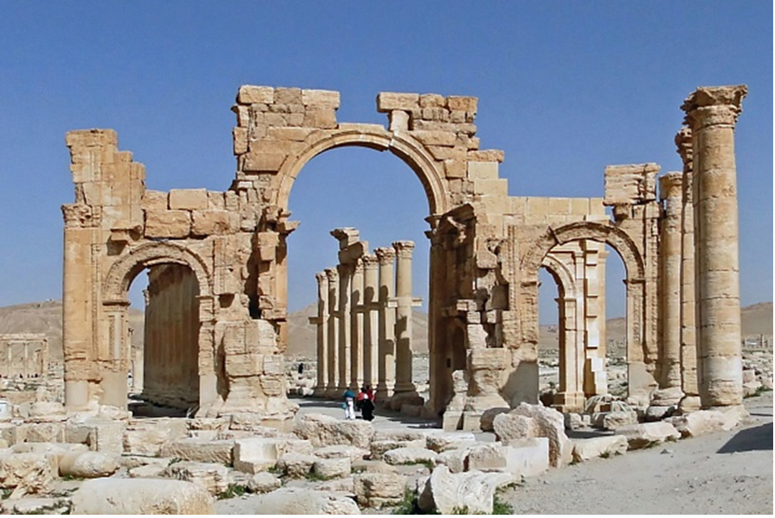 Palmyra, Syria: the colonnade, with the temple of Bel (temple of the sun). Engraving by G. Malbeste and R. Daudet the younger after L.F. Cassas. Wellcome Library reference 2851421i. 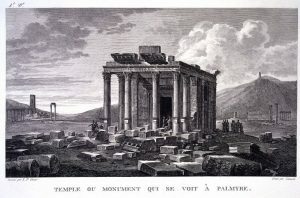 There are closer studies of the relics of the temple of Bel, such as the one below. Palmyra, Syria: the temple of Bel (temple of the sun) viewed from one side. 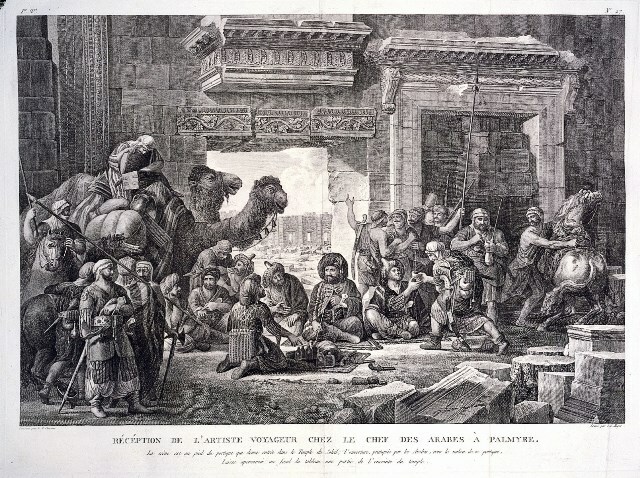 Engraving by J.B. Liénard after L.F. Cassas. Wellcome Library reference 2851419i. Studies of individual sections of the temple show the quality of the carvings around the doorways (though these really have to be seen in the original engravings rather than online). Palmyra, Syria: west door of the temple of Bel (temple of the sun). Engraving by J.B. Reville and P.G. Berthault after L.F. Cassas. Wellcome Library reference 2851402i. The smaller Temple of Baalshamin is shown on its separate site surrounded by massive slabs of fallen masonry. Palmyra, Syria: the temple of Baalshamin. Engraving by J.B. Liénard after L.F. Cassas. Wellcome Library reference 851414i. Although the figures among the ruins may appear to be routine staffage that has just walked in from a Capriccio by Giampaolo Pannini, some of the activities are quite specific. For instance, a close look at the panorama reproduced above reveals a horse race on the right and preparations for a camel race on the left. Palmyra, Syria. Detail of Wellcome Library reference 2851421i. 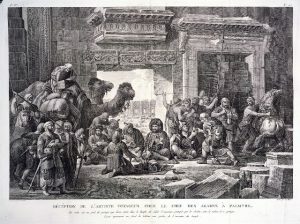 Possibly the most eventful of the Palmyra engravings by Cassas is one that shows his reception in the city. 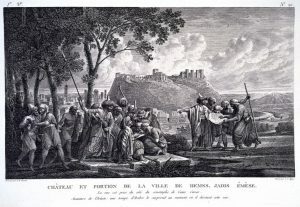 Palmyra, Syria: Louis-François Cassas, received by an Arab chief in the temple of Bel, offers him bottles of liquids and pistols. Engraving by S.C. Miger after L.F. Cassas. Wellcome Library reference 2851433i. Cassas is seated on the left dressed à l’orientale, offering various bottles (of cognac?) and a selection of pistols to his hosts. They seem to be trying to impress him by arranging the reception in the shadow of the most elaborate stone carvings which protrude deeply and precariously from the wall. Quite a virtuoso portrayal, considering that Cassas is drawing his own portrait from the back. 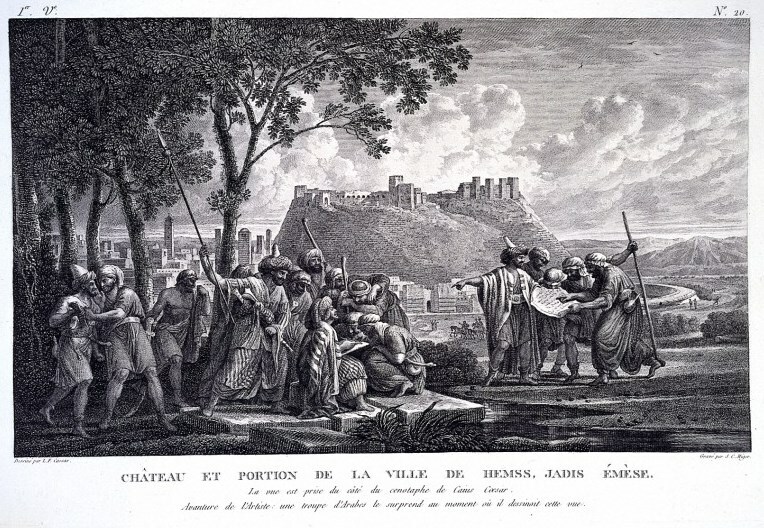 He performs a similar trick in one of his engravings of another Syrian city: Homs in Syria (Greek and Latin Emesa). Homs, Syria: the citadel and part of the old city, with the artist Louis-François Cassas surrounded by locals. Engraving by S.C. Miger after L.F. Cassas. Wellcome Library reference 2851390i. Here Cassas himself is seated in the centre, sketching the scene, while officials on the right examine his passport, and some hot-headed Emesans draw their weapons at him on the left. Other places visited by Cassas include Antioch (now in Turkey) and various sites in the modern states of Lebanon and Israel. Bowman AK et al (editors). The Crisis of Empire, A.D. 193-337 (The Cambridge ancient history vol.12). Cambridge: Cambridge University Press 2005. On the significance of the recent destruction: Robert Bevan. The Destruction of Memory: Architecture at War, 2nd expanded edition. London: Reaktion Books 2016.